Yes! I've been looking for another one of these since the Naxx one rotated out. Silence Priest is so fun to play! Where's Zombie Chow when you need it ? I love the flavour of this card. Freeze mage counter. Imagine having big minions and the mage freezes them. With this minion you make sure that your giants attack the opp's face. 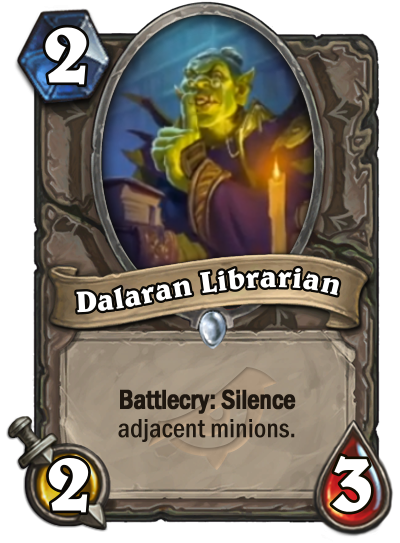 And, yeah, an inclusion in the fabled Silence Priest deck. Well after introduction of all silence cards, I guess it is safe to say Silence Inner Fire Priest will be a thing. Naturally this shows up AFTER Humongous Razorleaf rotates! I love the flavor of this card. Good taunt bypass for Aggro. Silencing friendly minions isn't just for Priests anymore. The low cost of this card makes any possible synergies easy to pull off, and it has good stats for its cost to boot. Whether or not it takes off is one thing, but being able to silence two minions on one card for 2 mana is a big deal. As such, I could see the "can't attack" package - Ancient Watcher, that new 3 mana 5/6 "can't attack without spell damage", and perhaps one or two cards I'm forgetting are still in standard - they have potential with this. Hell, turn 2 Ancient Watcher into turn 3 5/6 into turn 4 silence + something else (maybe 2 mana removal) is pretty decent, attack with a 4/5 and 5/6. Of course, the problem with it all is consistency, but when it does happen it's fairly high tempo, so hopefully it's in a deck that can make up for that inconsistency by either including more silence tools (ie. priest), or having a solid shell around those shenanigans (potentially something like old school style handlock). Great card, and i am glad to see the effect of Wailing Soul return. Silence priest loves this. There's also Quartz Elemental, also works decently on Hench-Clan Shadequill. 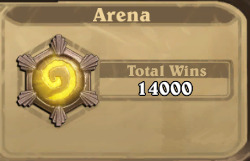 Very good - also decent stats - i think silence Priest will be a thing again! "Challenge me ... when you're ready to duel a god!!"